100% authentic POLO RALPH LAUREN. Large Bath Towel. Pink colour with contrast White Embroideries Logo. 100% authentic POLO RALPH LAUREN. Large Bath Towel. Turquoise colour with contrast White Embroideries Logo. Includes : 3 Bath Towels. Helpful Links. Sheets & Pillowcases. Quilts, Bedspreads & Coverlets. Pillow Shams. Mattress Pads & Feather Beds. Duvet Covers and Sets. Decorative Bed Pillows. Talmadge Hill. Set Of 6 Washcloths. Ralph Lauren. RALPH LAUREN. Bath towel W 70cm x 130cm. 2 Piece Towel Set. Hand towel W49 cm x L92cm. Gorgeous and classic leopard pattern from Ralph Lauren! INCLUDES (1) BATH TOWEL 27 X 52" CREST MADE IN THE U.S.A. 100% COTTON. Natural Taupe. Ralph Lauren. Bath Towel. Soft Cotton. Color PALE SURF. COMPREND (3) SERVIETTES DE TOILETTE 12 X 11 ". Type Face Cloth. Pattern Solid. Navy 50x100 cm. Ralph Lauren Hand Towel. Navy and White Polo Pony. RALPH LAUREN. French Terry. Beach Towel. Ribbon Trim. 100% Cotton. Length: 72". Width: 41". Polo Ralph Lauren. Bath Towel 142cm x 74cm. Hand Towel 102cm x 49cm. This is for a set of 2 Towels. Manufacturer Color: Faded Denim - See Photos. Labels may have a mark on them. We make a mistake once in a while, after all we are human. Material: 100% Cotton. For distressed jeans there may be slight variations from pair to pair in the distressing. INCLUDES (1) BATH TOWEL 26 X 48" BLUE TATTERSAL. 100% COTTON. Ralph Lauren Sophie Brooke Bath Towel Very good condition. No stains or holes. 26” x 47” Matching hand towels in my store. I combine shipping. Comes from a smoke free environment. Fast shipping with insurance and tracking. Set Of 3 Washcloths. New ~ One of the washcloths was dirty on the edge. Ralph Lauren. Winter Garden Leaf. Hallo, Biete einen original Strandtuch / Badetuch aus dem Hause Ralph Lauren. Neu und nicht benutzt mit Etikett. Maße: 90cm x 166cm. Mehrfarbig und 100% Baumwolle. !! !Versicherter Versand mit Sendungssnummer!!! Da Privatverkauf keine Garantie und keine Rücknahme. Color CADET GRAY. INCLUDE (4) ASCIUGAMANI DA BAGNO 12 X 11 ". Pattern Solid. 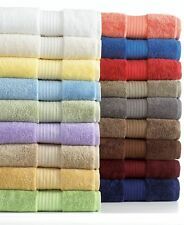 (1) BATH TOWELS 27 X 46". POLO PONY IS BLUE. (1) HAND TOWEK 16 X 28". COMPREND (3) SERVIETTES DE TOILETTE 12 X 11 ". Material 100% Cotton. Type Face Cloth. Pattern Solid. Manufacturer Color: Lagoon Blue - See Photos. Manufacturer: Ralph Lauren. Material: 100% Cotton. Manufacturer Size: 12" x 13". For distressed jeans there may be slight variations from pair to pair in the distressing. 100% authentic POLO RALPH LAUREN. Extra Large Bath Towel. Pink colour with contrast White Embroideries Logo. Color REGATTA CREAM. (3) WASHCLOTHS SERVIETTES 11 X 12 ". Pattern Solid. RALPH PALMER PALE BRIAR GRAY (3PC) SET WASHCLOTHS FACE CLOTHS TOWELS 13 X 12"
INCLUDES (3) WASHCLOTHS TOWELS 12 X 11". Color BRIAR GRAY. Type Face Cloth. Talmadge Hill. Set Of 4 Washcloths. Ralph Lauren. NWT, never used. Vibrant colors, soft cotton.